Walnuts are part of the tree of the nut family. There are numerous walnuts heath benefits which make it not only great in taste but also a rich source of heart-healthy monounsaturated fats and an excellent source of those hard to find omega-3 fatty acids. Like most nuts, they can easily be added to your Healthiest Way of Eating. Walnuts contain several unique and powerful antioxidants that are available in only a few commonly eaten foods. Here on this page, we will see important health benefits of Walnuts. Walnuts are the top nut for brain health. They have a significantly high concentration of DHA, a type of Omega-3 fatty acid. The human brain is made up of about 60% of what is called “structural fat” and needs high-quality fats like omega-3s to function properly by keeping the brain fluid and flexible. Walnuts are loaded with omega-3s, which make them the ultimate “brain food.” Walnuts contain a number of neuroprotective compounds, including vitamin E, folate, melatonin, omega-3 fats, and antioxidants. Research shows walnut consumption may support brain health, including increasing inferential reasoning in young adults. A Walnut looks like a little brain, a left and right hemisphere, upper cerebrums and lower cerebellums. Even the wrinkles or folds on the nut are similar to those of the neo-cortex. Scientists claim that walnuts help in developing over three dozen neuron-transmitters within the brain enhancing the signaling and encouraging new messaging link between the brain cells. 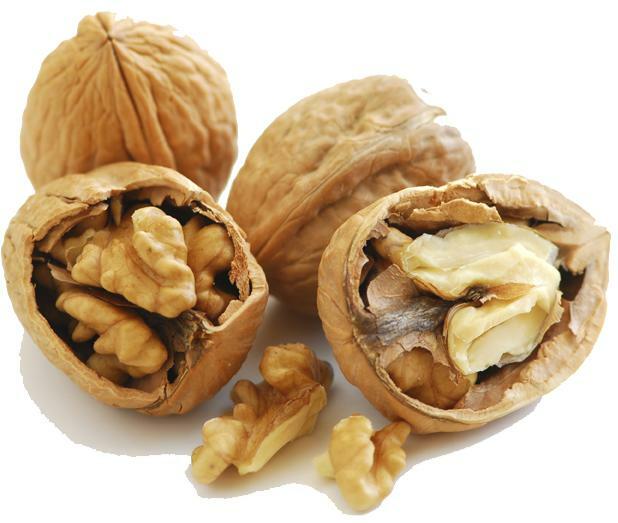 Walnuts help warding off dementia. They also extract and break down the protein based plaques associated with Alzheimer’s diseases. Walnuts reduces the risk of Cancer. Eating Walnuts may help reduce not only the risk of prostate cancer but breast cancer as well. Walnut oil is available commercially and is chiefly used as a food ingredient particularly in salad dressings. It has a low smoke point, which limits its use for frying. Walnuts are good for Heart Health. Walnuts contain the amino acid l-arginine, which offers multiple vascular benefits to people with heart disease, or those who have increased the risk for heart disease due to multiple cardiac risk factors. Walnuts also contain the plant-based omega-3 fat alpha-linolenic acid (ALA), which is anti-inflammatory and may prevent the formation of pathological blood clots. Eating just four walnuts a day has been shown to significantly raise blood levels of heart-healthy ALA,3 and walnut consumption supports healthful cholesterol levels. Eating Walnuts regularly helps to boost Brain Development in Infants. Although not much research has gone into the safety and benefits of consuming walnut during pregnancy, it is believed that walnut may stave off nausea during pregnancy and boost brain development in the child. The United States is the world’s largest exporter of walnuts. Walnuts, like other tree nuts, must be processed and stored properly. Poor storage makes walnuts susceptible to insect and fungal mold infestations. Just chop and add to your favorite salad, vegetable dish, fruit, or dessert. Walnut health benefits include a nut which is good ‘hair food’ too. This is because walnut contains biotin (Vitamin B7) that helps strengthen hair, reduce hair. The anti-inflammatory nutrients in walnuts may play a special role in support of bone health. Freshly harvested raw walnuts with a water content of from 2–8 percent offer the best color, flavor and nutrient density. Walnuts are high in protein, vitamins, omega 3 fatty acids, trace minerals, lecithin, and oils. Compared with other nuts, which typically contain a high amount of monounsaturated fats, walnuts are unique because the fats in them are primarily polyunsaturated fatty acids (PUFAs) and are the only nut with a significant amount of alpha-linolenic acid.